Short walk to the beach. 1br/1ba condo Sleeps 4, great pool! Property Size 722 sq. 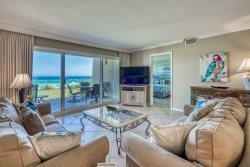 ft.
Rollin Tide Villas is nestled in the heart of Seagrove Beach, just a few minutes from Seaside/Watercolor and within walking distance to several shops and restaurants. Enjoy the heated swimming pool or take a short stroll the the sugar white sand beaches and emerald green water of the Gulf of Mexico. This adorable one bedroom condo is completely renovated with new tile floors, new granite countertops and new stainless steel appliances, and all new furniture. The bedroom has a king size bed in the Master and a queen sleeper sofa in the living area. It is located on the ground floor and has a patio overlooking the pool. There is a TV in every room. The kitchen is fully stocked for the nights you may want to stay in and cook. The beach walkover is only about a 4 minute walk from the condo. The condo has a washer and dryer. Add $85 for housekeeping and 11% for tax. There is a $30 booking fee and a $69 damage protection fee; 2.5% convenience fee on credit card payments. A deposit of 25% down payment holds the unit for you and is applied toward your final payment.